Hardcover with jacket, 288 pages, 16.5 x 24.0 cm, 6.5 x 9.4 in. On 27 January 1945, Soviet soldiers liberated the Auschwitz concentration camp. More than a million people had been murdered here by the National Socialists; only very few prisoners escaped with their lives. For years, most of those who survived the ordeal were unable to speak of what they had been through. They felt incapable of talking about the excesses of humiliation they had been victim to in Auschwitz, or no one was prepared to listen to their recollections. SPIEGEL editors and journalists have now travelled all over the world to visit and interview former inmates of the concentration camp, and Susanne Beyer and Martin Doerry have used their reports to compile this book. 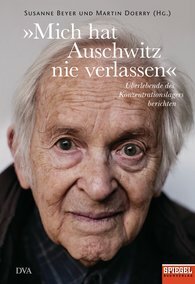 The impressive accounts by the last remaining survivors of Auschwitz have been lavishly illustrated with portraits taken for this volume by photographers Sara Lewkowicz and Dmitrij Leltschuk. "The reports are penetrating, disturbing, and brutally honest. The dignity these people emanate is immense."